Meanwhile, the America's Cup finish is worthy of further discussion, perhaps for decades to come. It was an amazing comeback, one of the greatest in all of sports history and certainly in the Cup. ORACLE TEAM USA won 11 races to score the 9 points required for victory due to a penalty imposed by the International Jury. Just last Wednesday, Sept. 18, Oracle trailed the series 8-1. With the challenger on match point, the defender closed out the series with an incredible eight consecutive victories. 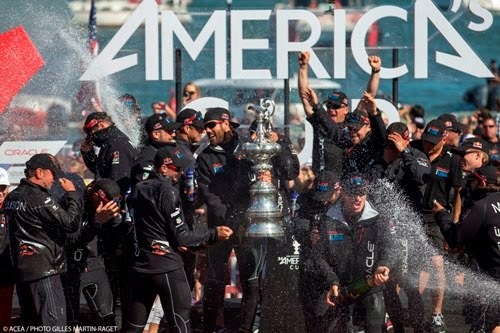 This was the third time in the history of the America’s Cup with a winner-take-all final race. Previously, the defender won in 1920 and the challenger won in 1983. Both times the winner rallied from a multi-race deficit, but never anything amounting to eight straight wins. If you are one of our readers in San Francisco and are yearning for more sailing action on the Bay, you're in luck. The annual Rolex Big Boat Series, in its 49th running, is scheduled to start today. The four-day event will see more than 600 competitors sailing in IRC and HPR handicap divisions as well as five one-design classes (Melges 24, J/105, J/120, J/70 and Express 37) and - what everyone seems to crave more of now - a performance multihull class. If you're interested in checking out this event, visit rolexbigboatseries.com.